Typically, when I grocery shop, I try to cover the entire week - lunch and dinner for two, plus occasional breakfast foods and regular snacks. I enjoy cooking, so I usually try to cook enough dinner a few times a week so that leftovers can be eaten for lunch, but sometimes, I'll pick up dedicated lunch items for my husband and me. Since I don't work terribly far from my office, many times I just head home for lunch to break up the day, and then I don't worry about packing my lunch each morning. The difficult part is when I haven't planned well enough, or something comes up in the day, and I'm stuck having to find food at the last minute - and that's when things get a little wasteful. But, I'm here to help you pack a waste-free lunch, especially since our Project Front Yard challenge is TOMORROW! These can be either purchased food storage containers, or repurposed things like mason jars. When I started at my current job, I invested in a clearance plate and bowl from Target to keep at my desk, and I moved a few coffee mugs over from home. Combined with a dish towel and a fork and spoon, I'm covered for when I need to eat at work. 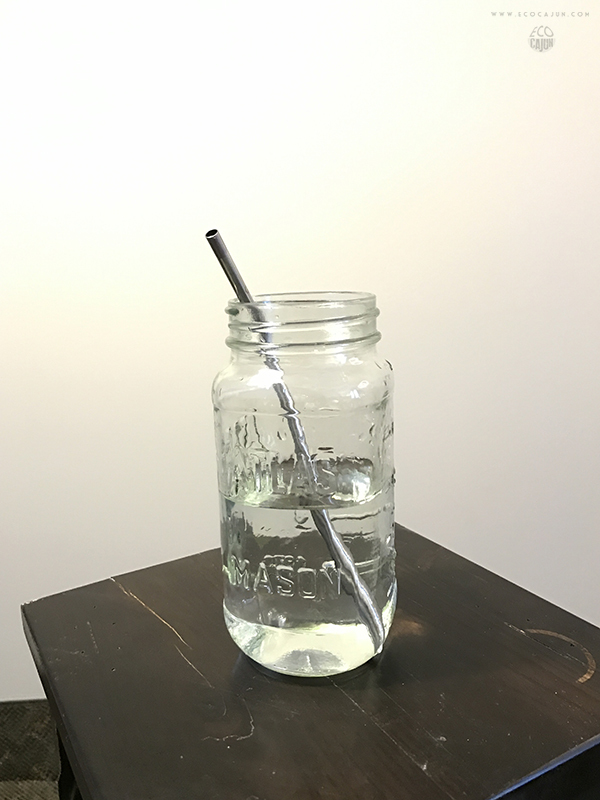 I've also recently added my collection of stainless steel straws, and the added bonus is that they make perfect reusable coffee stirrers! It also helps if you have a sink available to wash your dishes, but if not, just close everything up and bring it home to wash. 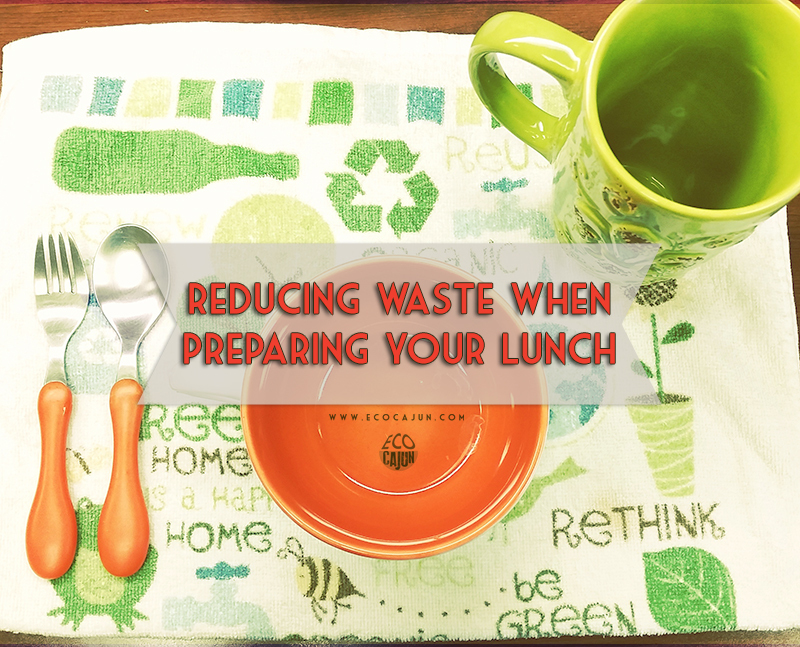 If you're on the go, or not near a kitchen during lunchtime, you can still easily have a waste-free lunch, but you may want to adjust to pack foods that don't need to be reheated, or that require utensils. You might be wondering, "What exactly are my food options?" If you like to cook, divide and package your leftovers into smaller containers that you can quickly grab on your way out of the house. I'm a fan of quinoa-based dishes, since we've cut most pasta out lately. Sandwiches and wraps are simple to make and pack well in reusable containers. Prepare your own chicken, tuna or egg salad. 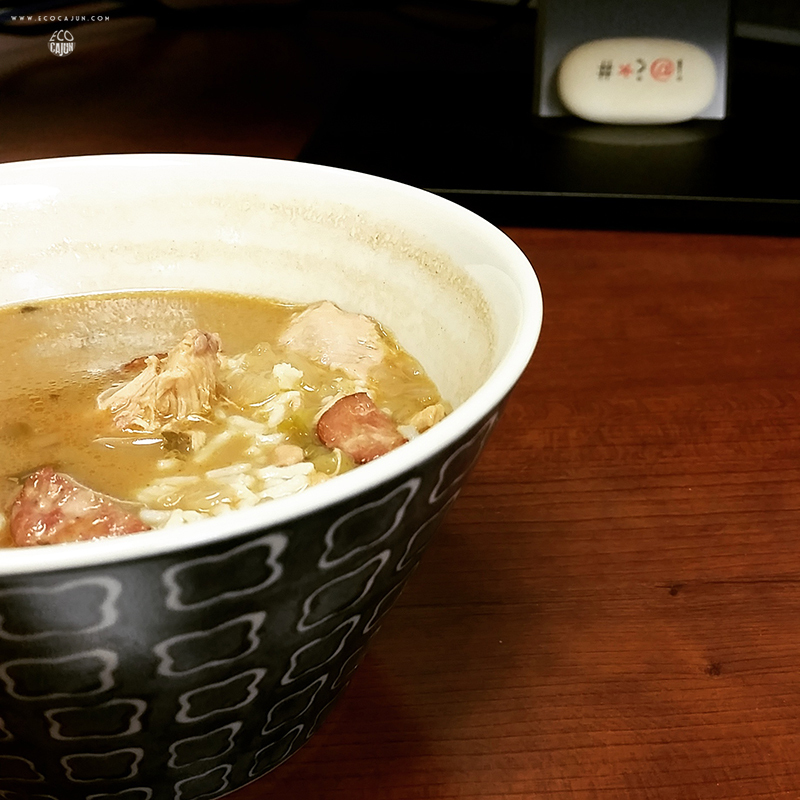 Leftover or frozen soup or gumbo is perfect on rainy days. Check out Zero Waste Chef for some more lunch ideas. When my company had food service available, I would bring my trusty bowl for salads and bring it back to my desk, in order to save on the plastic tray. And no matter what you do, I am telling you - do not reheat your food in plastic or styrofoam containers! It is so, so bad for you. Plastic and styrofoam are made with petroleum-based materials, so you don't want those leaching into your food. If you don't have the luxury of keeping a plate or bowl on hand, invest in some glass or Pyrex containers (and microwave them without the lids). So, that's how you can be waste-free for your own lunch, or your spouse's. What about your children's lunch? 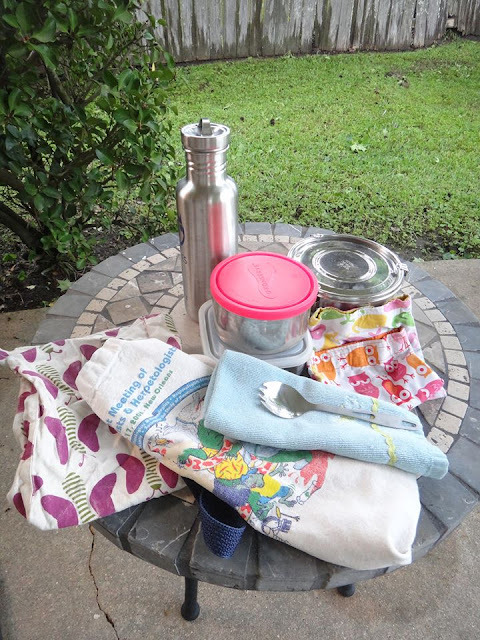 Amanda of No Waste Louisiana, another group helping to plan tomorrow's Waste Free Lunch Challenge, shares the ways her two daughters bring waste-free lunches to school. 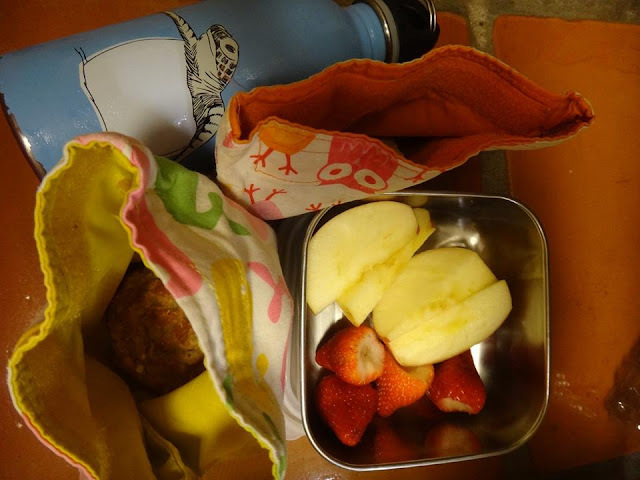 "We use reusable cloth lunch bags, which get washed in the washing machine weekly, stainless steel water bottles, stainless steel containers for fruits and veggies, and a cloth napkin," Amanda says. The stainless steel containers and bottles are extra durable and can withstand being dropped on the ground, and the cloth snack bags are great for chips, crackers, biscuits or muffins. Amanda includes her own dedicated zero-waste lunch routine: "I eat pretty much the same lunch daily and I love it: a big green salad and a peanut butter sandwich. I buy peanut butter from the peanut butter machine straight into a glass jar (a recycled jelly jar) and I make my own bread with two bags of flour (I compost the bags), olive oil (in glass I recycle), salt, honey (in glass I return to local folks), yeast (in glass) and oat bran I buy in bulk with a reusable cloth bag and store in glass jar that was a jelly jar at home. "My salad is greens and carrots from my garden, or I buy unpackaged loose lettuce and carrots. I make my salad dressing using a glass honey jar, mixing olive oil, balsamic vinegar, salt and pepper. I will bring this lunch in reusable containers in a cloth bag with napkin and stainless steel water bottle," she explains. In addition, Amanda stays stocked with a set of sporks and stainless steel pint cups, so she and her family are always prepared while on the go. If you're still curious about aspects of a waste-free lunch, leave a comment below, and I look forward to seeing you all participate in tomorrow's Waste Free Lunch Challenge! 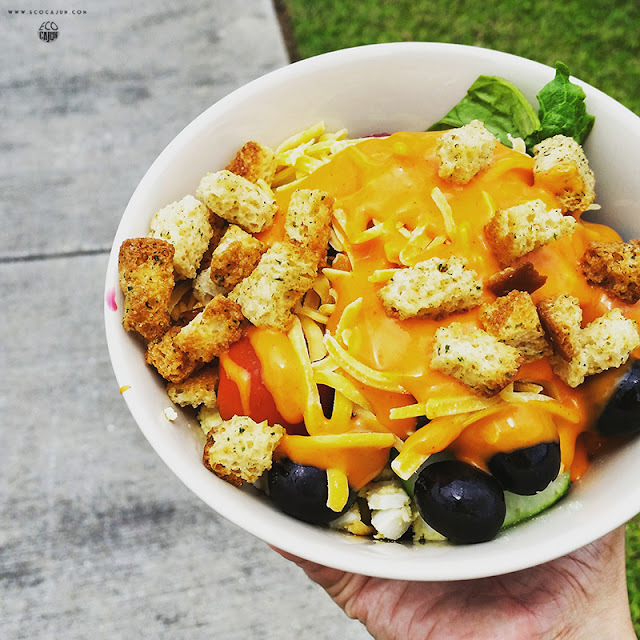 Take a photo of your waste-free lunch and post on Facebook, Twitter or Instagram with the hashtags #ProjectFrontYard, #FestivalofService, and #WasteFreeDay! Even if you're not in the Acadiana area, join in - let's see how widespread this challenge can go!